Though most of the sources for these ideas come from conspiracy theorists, there are those that say that the Egyptian pyramids were built as some form of pumps, or to generate electricity. The methods by which these design purposes are achieved, as described by the websites and such, do appear to be scientifically sound. So, regardless of whether or not the pyramids were originally intended to fulfill the function of water pump or electrical generator, could they have, being complete in structure and not the modern ruins, have actually done either of these? Stone Henge built by a "wizard"? Why is cannabis illegal and alcohol legal? The methods by which these design purposes are achieved, as described by the websites and such, do appear to be scientifically sound. Good pseudoscience can be quite convincing to non experts. Could you point me to one or more websites that appear to offere scientifically sound explanations for the alleged mechanism. I should b surprised if the soundness could not be quickly shown to be false. Gah. Cannot find the websites I was referring to. The only ones I am seeing now are... ridiculous, to say the least. I suspect, ultimately, this would prove true of all of them. But if you run across one that has some credentials, do post a link. If the pyramids were indeed originally capped in gold or some other metal, when lightning struck it would tend to strike the high metal caps. darned entertaining light show, but any practical purpose is a whole 'nuther story. Most of the hypothesis I've read about make reference to the quartz component of granite. Hypothesis usually centers around either amplifying seismic vibrations, or harnessing sound. Carl Sagan did a show once where he took a bunch of known ancient machines, like the earliest known steam engine, and stuff like that. And he kind of chuckled that it seemed like most of those machines had been used to reinforce people's superstitions - like by making doors appear to open themselves or .. etc. Instead of being put to any practical use. The arguments for the pyramids to serve a high tech purpose are weak if you want them to do something spectacular. But somewhat more reasonable if all they were doing was pyrotechnics to impress an audience. It is a pity, then, that the pyramids at Giza - the ones typically featuring in this nonsense - are made of limestone, which is conspicuosly quartz free. The Grand Gallery and the King's Chamber are lined with granite. No unusual acoustics have been reported in these. There are pretty good pumps that can be made with the technlogy avaiable to the ancient Egytians, none of them involve pyramids. Nor is there any way in which a high pyamid of stone in any way pumps water. At least water pumping is something Egyptians might want to do. Electrical generator? There is no eletrical tech in antient egypt, so what would the generator be for? Some says that pyramids were made for extraterrestrial entities. Some say that water doesn't exist. At least water pumping is something Egyptians might want to do. Not just want: absolutely essential to the development of Egyptian civilisation. *If* there were one, the purpose would be to impress an audience with a "miracle", thereby reinforcing their allegiance to the state religion. There is reasonably good evidence of technology being used in that way in Greece. The use for quartz is in how it responds to physical stress, generating an electric potential when it gets compressed. That's a good part of why quartz oscillators are so reliable. They're semi-mechanical (piezoelectric) in nature. The first application for such crystals was actually the harnessing of sound in sonar devices. Of course that doesn't necessarily mean that granite makes a good oscillator. That might be where the hypothesis breaks down. I don't know enough about them to know if they have any useful properties when they're not cut for it. I've read all sorts of different theories as to what pyramids are, or more precisely were, for. Many of these theories seem to lack any real credibility as they tend to ignore the evidence or simply make wild leaps of speculation. Now I haven't read or seen anything that would lead me to believe that the Egyptian Pyramids that we know about were designed or even used to generate electricity. Really though in order to make a more accurate determination one that they could have been we need some pretty striking evidence of how the electricy would have been used, conducted, generated or stored. The evidence we do have is interesting because it paints a picture that the ancient Egyptians were able to use relatively complex mechanism and elaborate traps to prevent theives from gaining access to treasures inside their pyramids. Some of these devices haven't been entirely understood and this has led to all kinds of speculation that the pyramids were designed for something other than mere monumental tombs. One of the other main reasons for the speculation is that pyramids are not geographically restricted soley to Egypt, various types of pyramids have been found around the world. Again this has led to all sorts of possible connections and explanations being proffered forward, everything upto and including extraterrestrial alien influence upon a global scale. In reality there are far more likely and practical explanations, such as that many of pyramids found in other places around the world we built well after the great pyramids of Egypt. This means though whilst the world's trading routes of the time are not totally understood it could still well be possible that stories and pictures of Eqypt's pyramids were carried off to distant lands where the local inhabitants themselves sort to make their own version of a pyramid. Also there is another simple explanation that may explain some the world's other pyramids, though many may find this explanation more difficult to accept, this is that of coincidence. Different cultures designing the same objects and buildings would certainly not be impossible and also more plausable than alien involvement. What it all serves to show us is that there are many ideas and theories, some more plausable than others, but to have any serious credibility these theories need an evidential basis, they must be able to stand up to scrutiny and make sense in context with information we already do have, and as yet we have no evidence of the ancient Egyptians even using electricity. This is a more-or-less on the level site that doesn't try to draw unnecessary conclusions. It appears to be hosted by the group that actually conducted the expedition they're describing, using a small robot to explore the "air shafts" of the Great Pyramid. One possibility is that they might not have understood electricity fully. They might have discovered it, but not known all that we now know about it. Maybe they didn't know it could be stored. Maybe they didn't know it could be conducted. Maybe they might have found one, and exactly one, use for it, without knowing that any other uses were possible. The trouble right now is that no hypothesis today takes all the evidence into consideration, to form a complete picture. 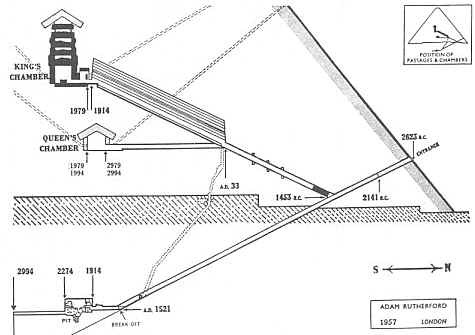 Why would the Great Pyramid of Giza have technically difficult shafts cut into it? If it was for religious reasons, then we might expect other Pyramids to feature them as well. But none of the practical explanations make much sense either. They weren't water tight, so it couldn't be to allow fluids to pass down them. Yes the problem is it's all speculatory, without evidence we can come up we any theory you like. No theory that's not evidential in basis will or could have serious credibility. We have evidence and records that the Egyptian pyramids were used as burial monuments, now unless or until substantiated new evidential sources are discovered I can't see any serious experts give any other explanation any serious credence. I read somewhere that many false chambers were constructed to prevent grave robbers and that the intricate tunnels were designed to keep an airflow throughout the building. Cannot verify, but sounds reasonable to me. It would be quite cool if they found the real burial chamber behind the stone slabs in the "air shafts". I actually think the upuaut project is one of the most exciting research projects that's been made and I hope they will continue. 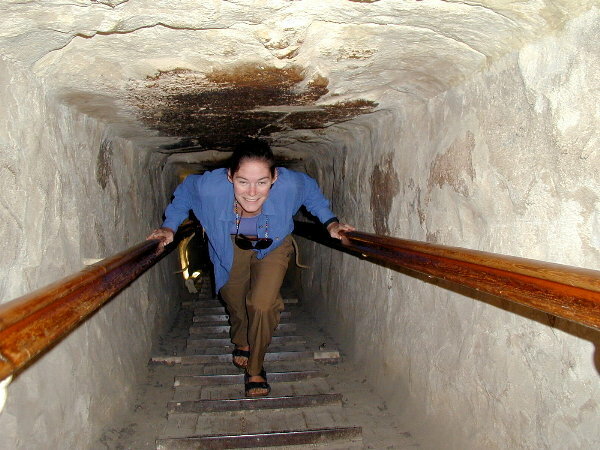 But as I understand it it's very hard to get permission to do research at the great pyramid. 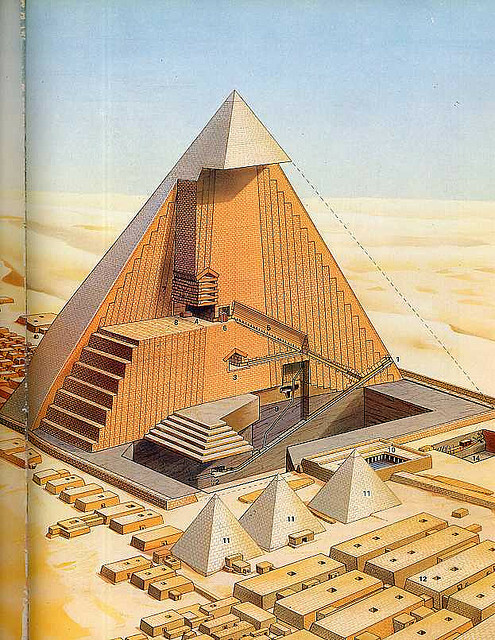 I think the electrical generator and pumps theories is more a result of adding extra value to the pyramids just because we find them so mysterious and awe inspiring. I mean, even to the pharaohs of the new kingdom the giza pyramids were also ancient and awe inspiring. I think they are fascinating and enough awe inspiring even if we let them be "just" monumental tombs. Without adding some exotic theory to them which doesn't seem to have any real good evidence. I dislike the alien theories the most because I think they underestimate human capability. I do know one story which may be of interest re the pyramids. During the building of the pyramids the workers (it is doubtful that they were slaves) were given regular rations of garlic with their food. During a poor harvest the pharaoh reduced the rations to the workers and as garlic was considered to have magical protective powers, the workers promptly went on strike and refused to work. This was duly recorded by the pharaoh's scribe and became the first recorded labor strike in history. I agree entirely. It's just like these idiots who can't believe that Shakespeare was clever enough to write his plays. There's no evidence that these ancient people were any less intelligent than we are. They may have had limited machinery, but they could measure and design perfectly well and they had lots of cheap labour. I didn't hear that before. Interesting. Just wanted to add that I think it's pretty safe to claim that the workers were not slaves (I don't mean that you said they were). Since archaelogists have discovered that surgery was used on some of the workers. This probably would not have been done if they were slaves. I originally saw it on another site, but this also confirms it. Another item of interest. In the dimensions of the pyramid, science wondered for a long time why "Pi" shows up everywhere in the pyramids. The answer is that in those days measurements were made with marked wheels and as Pi is a property of a circle, it became naturally a part of the design and building. Of course, they had no idea about Pi at that time. sculptor and Neverfly like this. Something that was absolutely essential, to this civilization dependent on the flooding Nile, was collective effort. At its best, this particular work ethic would want expression even in the off season. I don't think it really mattered what they did between farming operations, just so long as it was equally grand in scale. Here's some of the pictures that came back from Djedi. And this one shows the back of the barrier that had been drilled through, so you can see what the two copper objects on the front were all about. Kind of chuckle that they call it the "chamber of secrets". It probably didn't have any particular purpose like storing information. But it's interesting to see, because it's something the builders probably didn't leave for us to see intentionally. sculptor and babe like this. I wondered how this had escaped my understanding, and the understandings of those with whom I had discussed the quandry. has anyone looked into the math the ancient Egyptians used ? Whatever lunatic egyptologist came up with the idiotic idea that the ancient Egyptians used slave labor to move the stones for the pyramids is a discrace to all science. It is known that they used cattle for plowing, and that the apis bull guided people into the afterlife. So, why assume slave labor for building sacred places when there was no evidence for that conclusion, and plenty of reasons to find another idea? Is this racial arrogance run amok? I do not know the ratio about how many people one bull could replace for pulling/hauling heavy weights, byt assume that it would follow the relative weights of man vs bull. Each regular human hand may be said to have six unambiguous positions; a fist, one finger (or thumb) extended, two, three, four and then all five extended. So who actually uses base 6 in their language? Reportedly some people in Papua New Guinea (I wonder when they developed coinage), and Proto-Uralic uses that numbering system - from all of 4-9,000 ago. Which is (being generous) 3-8,000 years before coins were invented. 'twas just a convenient "circle" for modern understanding. To the best of my knowledge (and the two examples - one of which is "reportedly true" - are all I could find) no one uses base 6. Except, probably, mathematicians. Ergo I'd say it's either the finger-counting (for the examples 1) OR a "play system" invented specifically by mathematicians. 1 Because it's far more likely that people had a working dasis of mathematics - arithmetic at the very least I'd suggest - well before they got into drawing and "applying" circles. So you seem to be putting the cart before the horse here. however, developementally, we seem to use analogous thought, structures and constructs. Which would lead us to: all maths are based on abstract(ed?) numbering systems with varying bases, all numbering systems and bases are then based on real world examples, which have been inculcated into the spacial reasoning of the species. Of senary (base 6) there are remnants in Ndom language people. (indonesia, papua, New Guinea), and, perhaps within the reconstructed proto ural language group(which could push it's use back to 7000bc?). Which, it is widely believed the egyptians also used. Which(hopefully) brings us to the math base used by the pyramid builders? Has anyone plugged the angles and dimensions into base 6 math? or base 60? Last edited by sculptor; August 17th, 2013 at 03:58 PM. I guess I am stupid, or naïve, but I really thought from everything I have ever read is that the Pyramids were basically TOMBS! then the question obtains, why build it? Why build such a grand tomb. Is the pharo jumping up and down in front of the gods shouting "ME, ME' LOOK AT ME!" Was it done for the amusement of the egyptian people and/or ruling class? Did they make them simple, yet complicated(and real damned big) so that thousands of years later, we would be asking these questions? Why did mound builders build mounds? Why megalithic structures for thousands(tens of thousands?) of years? The Chinese were building pyramids even before the Egyptians. Despite claims to the contrary, the existence of these pyramid-shaped tomb mounds was known by scientists in the West before the publicity caused by the story in 1947. Shortly after the New York Times story, Science News Letter (now Science News) published a short item saying "The Chinese pyramids of that region are built of mud and dirt and are more like mounds than the pyramids of Egypt, and the region is little travelled. American scientists who have been in the area suggest that the height of 1,000 feet (300 m), more than twice as high as any of the Egyptian pyramids, may have been exaggerated, because most of the Chinese mounds of that area are built relatively low. The location, reported 40 miles (64 km) southwest of Sian, is in an area of great archaeological importance, but few of the pyramids have ever been explored." Victor Segalen visited China in 1913 and wrote about the First Emperor's tomb (and other mound tombs in the region) in Mission Archeologique en Chine (1914): L'art funeraire a l'epoque des Han. I'm thinking it might be helpful to post some diagrams. Also a few internal pictures with people in them, to give a better idea how it looks. It's because a later account by the Greek historian Herodotus around 500 BC claimed it had been slave labor. Clearly he was just writing down rumors, but they were believed because it was a 2000 year old rumor referring to an event that was at that time also another 2000 years prior. Ascended, sculptor, Neverfly and 1 others like this. No, they did not. A typical example of using a constant without knowing the actual equation involved. While approximations of Pi were made by mathematicians of old, they were all wrong because they did NOT have the proper way to calculate Pi. Let's not forget that they measured straight lines of different lengths, not circles of different diameters. Using a wheel was a convenience and not of scientific value for the design (except incidentally). When later mathematicians analyzed the pyramid's dimensions the implication of Pi was noticed. But Egyptians just used wheels to measure, just as we do today and I don't think of Pi when I measure 100' using a measuring wheel. There's a certain amount of arrogance involved in assuming the ancients "didn't know". Half the "ancient aliens" hubbub is about silly assumptions that the ancients couldn't do this or couldn't do that, leaving .... of course... aliens as the only explanation, right? Let's try to avoid walking down that road. They might have understood pi's significance without knowing how to properly derive it. Is it likely that Herodotus got it wrong intentionally due to feelings of nationalism? 2. Because Pharoah's were kind of like "GOD"
I can't derive pi and I can't build a pyramid. That doesn't make me dumber than an Egyptian, just different in some ways. Can you "WALK LIKE AN EGYPTIAN?" We are all different. It would be a pretty boring world if we were all the same, spoke the same lanugage, thought the same concepts and things. Who knows? Maybe it was a play, or book, or painting that inspired the people of Egypt to have such nationalism as to believe in themselves enough to build that pyramid in the first place. It's not just about planning and engineering. In order to get that many people all gathered in one place and working together you also need a dream to inspire them. The people side of the construction is just as interesting as the physics and math side, especially in this case where all the physics and math is basic by modern standards. It's not just about planning and engineering. In order to get that many people all gathered in one place and working together you also need a dream to inspire them. Maybe, but someone had to be the voice of that god. Most gods in antiquity weren't able to speak for themselves for some reason. They always "chose" to have a priest or someone like that speak on their behalf. Apparently, someone learned the 'secrets' of the pyramid builders and built a place called Coral castle. Youtube it up, I think it is very interesting. P.s the link above is a video called 'Ancient Knowledge Part 3'. Is it one of those shows that doesn’t give human ingenuity much credit for the construction of the pyramids and simply attributes all the unsolved gaps to aliens? If so, then that’s not very sciencey! For some reason, it appears to attract people nuttier than the guy who built it. the man didn't like people watching him work, so no one really knows how he did what he did. I wouldn't call Wikipedia credible lol. The person who did this video looks like he/she has done some research but most importantly - you should do yours as well. They called people who thought the Earth was round nutters as well. But to the point, if you haven't watched it, done your research in this area or discredited it yet then maybe wait for someone who will? Its just another Theory, like the others out there. I posted the link because I want to learn more about the areas on this forum, so I thought this might be a good place to get some debate/conversation etc. For example, what does the Tablet of Shamash depict and could ancient civilisations have learned how to utilise powerful magnetic forces and sound frequencies to shift those stones? I'm sure you could do worse then spending an hour on this (e.g. X factor & other TV junk). Its about magnetism and cymatic frequencies - which, maybe according to the Tablet of Shamash, these ancient people knew about and utilised. This episode is about different facts relating to the pyramids which seems to blow away the main theory. The other parts go on to explain how it may have been done. In these situations I always remind myself of the shape people thought the Earth was - so I try to keep an open mind. Its another theory and I am not too convinced about the 'mainstream' theory. I wouldn't call Wikipedia credible lol. Then you don't know that much, do you? The person who did this video looks like he/she has done some research but most importantly - you should do yours as well. 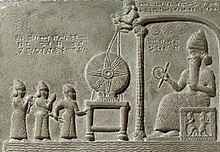 For example, what does the Tablet of Shamash depict and could ancient civilisations have learned how to utilise powerful magnetic forces and sound frequencies to shift those stones? Generally speaking stone isn't magnetic. And please provide a credible source for this claim of "sound frequencies shifting stones". Compared to yootooob? At least Wikipedia articles provide references for their information. What references does your video provide? Did they? Really? Did you get that from yootoob as well? Its just another Theory, like the others out there. Do you know what the word "theory" means in the context of a science forum? Saying "just a theory" is likely to cause a rather negative reaction from people here. Apparently, it "shows Shamash, the Sun God, beneath symbols of the Sun, Moon and Venus." and could ancient civilisations have learned how to utilise powerful magnetic forces and sound frequencies to shift those stones? Any evidence for the fact that magnetic forces can lift stones? Or that sound frequencies can lift stones? Or that ancient civilizations had access to the technology and power sources to generate either of these? Could you quote the part of the text from the tablet that says this. Why do some people seem to need some unknown force, magic, or aliens to account for basic engineering skills of our ancestors? i've worked with people who smelled like that! It is unacceptable to ask readers to spend an hour watching videos of any kind, let alone the sort of unfiltered stuff one finds on YouTube. It is unreasonable and disrespectul of people's time. If there is a decent theory involved, you should be able, either to summarise it yourself in a couple of paragraphs, or direct readers to a source that does so. If neither can be done, we are entitled to suspect the video will be short on logic and long on bamboozlement and woo-woo. John Galt and Strange like this. Well, what do you know, it's our old friends magnets and vibrations, yet again! All we need now is for vague mentions of "energy", shorn of any qualification as what form it is in, and we will have a full house of the standard New Age woo-woo obsessions. And we should all watch an hour of a video, on YouTube, no less, about that? Last edited by exchemist; September 28th, 2013 at 11:00 AM. A magician never reveals his secret. And he probably got all the more tourism by making it appear he had used mysterious effects to do it. He wrote a book, supposedly about some chauvinistic nonsense, called "A Book in Every Home" Which appears to be written in a kind of eccentric code language to describe something else other than what it directly says. He also wrote a number of pamphlets about electromagnetism. So, on the one hand, we're faced with the most plausible explanation: that he used levers and/or pulleys. But on the other hand, his own writings indicate that he seemed to be very interested in electromagnetism. so, how would electromagnetism effect coral? Nothing stops him from attaching metal to the coral before he moves it. If he used pulleys and levers and stuff, he'd probably also be attaching stuff to the coral. It sounds like Erich von Daniken's rants about the pyramids and ancient astronauts. Chariots of the Gods and all that. Hugely successful book. Of course. By successful I just meant it made a lot of money. And unfortunately many non-critical thinkers who swallowed the ideas. Von Daniken just has lots of enthusiastic optimism. People like that because science is usually more about skepticism. Go figure. His books are massively entertaining, but his use of logic is terrible. You just can't help but love the guy. And there is a useful aspect to his books. Before the woo starts, there is a brief moment where he's telling you the name and location, and basic features of the ruin or landmark he describes. Usually you'll want to google them, rather than read his depiction of them, though. Von Daniken just has lots of enthusiastic optimism. Pyramids and early civilisation,how could people build pyramids and structures that big.I looked at the pictures of the pyramids and they were fasinating.Mostly to me what was also of intrest was the hyrogliphics.I saw an egyption translation of their lettering system.It seems a lot of their letters mean god or somthing .Very religius.I was wonderin if anyone has ever tried translating their language using a decifering method.Like matching up what people talk about most commonly to the letters used most frequently.I'm guessing that early civilisations might not have been that religious.Their picture language doesn' look like it would be that hard to decifer.Mabe if that could work it might tell you how and why they built the pyramids.Like mabe they were trying to clame the niles water or something.That would probably make sense to an early civilization.Why couldn't they have caves like everyone else back then? sapien, suggest you do a bit of research. We have successfully translated most of the language including the mathematics that we know about. And people form that part of the word were far more likely to live in mud/straw huts or woven reed structures than live in caves. The pyramids are a fraction of the engineering these people did by hand assisted by some animals and a great knowledge of mechanics to build large things with simple technology-- the extensive canals and water control systems linking the Red Sea to the Mediterranean, now buried are arguable much more impressive and were more important than the pyramids to explain the long success of their civilization. Strange, Neverfly and babe like this. I was wonderin if anyone has ever tried translating their language using a decifering method. That is basically what was done. I'm guessing that early civilisations might not have been that religious. I don't know what you base that on. People haven't changed much over the years. Their picture language doesn' look like it would be that hard to decifer. Well, it probably would have been impossible without the Rosetta Stone. Although if it was known what language they used, it might have been possible. But we only know their language because we can read the hieroglyphs. Mabe if that could work it might tell you how and why they built the pyramids. Well, we can read hieroglyphs (and the other writing system they used) so we know why they built the pyramids. And a lot of other things about their civilisation. Piece of trivia for you: all European, and nearly all the world's, writing systems are ultimately derived from Egyptian hieroglyphs. Its not their cuniform or writing that seemed odd to me but their picture drawing.For example their picture that looks like a pyramid is supposed to mean god.What if it means pyramid or structure.Their picture of a circle with crosslines on top of it is supposed to mean the holy thing or somthing.What if it just specifies the location on the planet Egypt.Then the most absured one yet is the picture of a pan of water,which is suposed to mean the holy existance or something.What if it just represents water or nile or water with fish in it even.The cuniform looks like it is just some take off on the original pictures dran bt the aincients. .I saw an egyption translation of their lettering system.It seems a lot of their letters mean god or somthing .Very religius.I was wonderin if anyone has ever tried translating their language using a decifering method.Like matching up what people talk about most commonly to the letters used most frequently.I'm guessing that early civilisations might not have been that religious. Yeah. It seems more sensible to look at it the other way around. Maybe lots of common words are used to describe their gods, rather than their gods' names being used to describe common objects. I think modern Christians just desperately want the ancient peoples' whole lives to center on religion. It's a world view that they are comfortable with. There's also a bit of selection bias, because priests were more commonly literate than normal folk, so they would have left more behind for us to find. [Eye of Horus]; [Two reeds]; [Wiggly snake]? I'm not sure what you are on about but if you are interested in heiroglyphics do some research on the Rosetta stone and the work of Champollion. This thing certainly looks like a machine of some kind, but it's hard to tell what kind of machine. Maybe he was teaching them how to grind wheat? Amazing. An historic picture of the wheel being invented, Is that the original? Its not their cuniform or writing that seemed odd to me but their picture drawing. The Egyptians didn't use cuneiform writing. They used hieroglyphs. Although these look like little pictures, it is basically a writing system very similar to ours. The pictures started out referring to specific things (a house, a bird, water, etc) but they quickly realised that a full writing system needs to be phonetically based. Therefore they used the pictures as a "rebus" - i.e. it represents the sound corresponding to the thing represented. For example, this is like using a picture of an "eye" to represent the sound of the letter "I". For example their picture that looks like a pyramid is supposed to mean god.What if it means pyramid or structure.Their picture of a circle with crosslines on top of it is supposed to mean the holy thing or somthing.What if it just specifies the location on the planet Egypt.Then the most absured one yet is the picture of a pan of water,which is suposed to mean the holy existance or something.What if it just represents water or nile or water with fish in it even. There is no point saying, "what if, what if" when we know how to read it already. This thing certainly looks like a machine of some kind, but it's hard to tell what kind of machine. a) That is not Egyptian. b) The inscription says what it is a picture of. I can't seem to find anything about what the inscription actually says. Do you know what it says? I can never tell if I'm dealing with a sort of Alchemist type writing, where meaning is buried in seemingly ordinary text. And even within that, easily 3/4 or more of all alchemist type buried mystery writing was probably nonsense, woo, or deliberate mountebankery. The tablet could be a fraudulent description of a machine that never did what it was supposed to do, but which the royal court believed it could do. Or it could be some kind of really disingenuous religious symbology. Or it could be a basic blueprint for something, with many details left out. What is least likely, I think, is that it is a direct depiction of anything that existed at the time. Only a blueprint that was useful enough to be valuable would get put in a place of reverence. The picture you posted is named. The cuneiform text beneath the stele is divided into fifteen passages, blending prose, poetic and rhetorical elements in the fashion typical of Mesopotamian royal inscriptions. It tells how Sippar and the Ebabbar temple of Shamash had fallen into disrepair with the loss of the statue of the God. This cult image is temporarily replaced with the solar disk; it is further described how a new figure of Shamash was found in an eastern part of the Euphrates, from which Nabu-apla-iddina has constructed a new statue of lapis lazuli and gold to restore the cult. Of course it could be. It could be an illustration for HG Well's The Time Machine. It could be all sorts of things. Let's ignore the long inscription saying exactly what it is and make up some stories. Just found the above as well. Must have been incorrectly named. the then king rebuilt the temple to the "sun god" 2-3 centuries after the original. In all likelihood, even the rebuilding king didn't completely understand the symbolism contained on the tablet. standard fare--the people or subjects would always be depicted as smaller than the king or a god. the lead "human" is reaching out and holding the leg of the platform that is also suspended via ropes held by the "god's?" assistants. Gods? Masters?Holy ones.Get to the bottom line .Who built the pyramids and why. The Egyptians built them as tombs for the pharaohs. There is a long history of similar structures in other parts of North Africa going back many centuries. It would be good if someday science would unravell all of the mysteries of the mummies and why they were so sure about the afterlife as to build pyramids as tombs. EGYPTIAN SLAVES AS TOMBS FOR PHAROAH'S? Wrong. Paid workers were employed to build the pyramids. pyoko and sculptor like this.
? Also the mummies before they were wrapped up had their brains removed, sucked right out of their heads. Were the brains stored with them,or they wandering around through the afterlife without brains just a lot of gold and riches. Should you or should you not take money from zombies? Someone on this post said the pyramids were covered with gold. Where did they get all of the gold from and where did it go to? I imagine the gold was mined and when the city began to decline, the gold was slowly stolen by thieves. Also the mummies before they were wrapped up had their brains removed, sucked right out of their heads. Were the brains stored with them,or they wandering around through the afterlife without brains just a lot of gold and riches. And others like them ensure the world pays attention to them by slathering them all over T.V. Should you or should you not take money from zombies? If the zombies are offering up cash- who am I to say no? A paying customer is a paying customer- their lifestyle is none of my business. Strange and exchemist like this. There is some evidence that the workers were not actually slaves, but "paid" volunteers, who were definitely free. Please don't ask for for a reference. It's too early in the morning. Silly copyright issues? Hardly a criminal. If they were covered in gold (I don't know if that is true) then it would have been stolen quite soon. Nearly all the tombs were robbed at some point. But the mummy's brain was not considered important, and it was thrown away. The thinking process was considered a function of the heart, not the brain. The Bosnian pyramids... what do you think: are they real?